The beach, the spa, and a date with Big Bird. That’s right, I’ve found the ultimate family vacation at Beaches Negril Resort & Spa – a place where I can vacation with my family; and actually relax with some me-time. When it comes to taking family trips we moms are often the last ones to kick our feet up and enjoy the journey. We’re too busy planning, packing, picking up after, and making sure everyone else is happy. After spending five nights at Beaches Negril when I recently visited Jamaica to run in the Reggae Half Marathon, I’m convinced I’ve discovered my mom-paradise and can’t wait to bring my family back with me. I’m a fan of all inclusive because I love not having to worry about budgeting money for meals, drinks and activities while I’m trying to relax. One of the things I like most about this resort is there are plenty of opportunities to spend quality family time together – and a part. Trust me, your kids (14 and under) won’t mind getting a little space from mom and dad at Kids Camp or spending time in the state-of-the-art Xbox Play Lounge while you’re getting a massage on the beach. It’s a win-win. I had fun touring and taking part in many of the activities available at Beaches Negril and will share more details in a series of posts highlighting the rooms/accommodations; Kids Camp and The Sesame Nursery; the Xbox Play Lounge, Trench Town Teen Center and Scratch DJ Classes; the Red Lane Spa and the Fitness Centre; and the Night, Night Tuck-In where a Sesame Street character actually comes to your room to read to and tuck your child into bed. Fun for everyone. 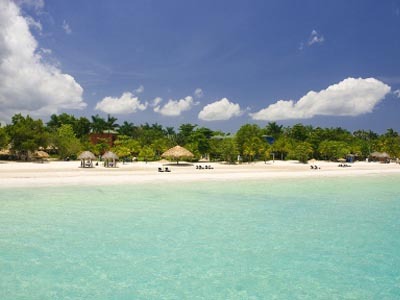 For more information about Beaches Negril and other Beaches Resort locations, visit www.Beaches.com. Lorraine Robertson is an author, nationally published freelance writer and creator of the site RunWifeyRun.com. After two marathons, 12 half marathons and countless smaller races she’s still packing her running shoes and looking for her next great race. Lorraine was featured on the Travel Channel’s “Great Cruises: Why Not The Mediterranean?” television show and her life-changing wedding appeared on TLC’s “A Wedding Story.” She lives in the metro Atlanta area with her husband, Napoleon and their kids, Miles, 11, and Milan, 9. Disclosure: I received a media rate and some additional accommodations for review purposes. As always, my thoughts and opinions are all my own. Photo Credit: Beach and Water Slide Photos provided by Beaches Resort. That sounds amazing. I was just watching a commercial there and thought that’s our next family vacation!